Freshman Del. Deborah Rey is not afraid to stand alone in opposition to legislation. There she was again on the House floor Wednesday morning. The Republican legislator was the lone voice questioning a bill sponsored by almost all the Republicans in the Senate to require a ballot be counted even if the voter subsequently died before the vote was tallied. The Senate passed it unanimously, and except for Rey’s red vote, the House would have too. Rey thought it conflicted with other state law. “It’s not personal, it’s policy, ” Rey says, explaining her renegade votes against bills sponsored even by members of her own Republican Party. Yet Rey remains soft-spoken with a pleasant demeanor. Legislators have come up to Rey in the past, she said, teasing her for always speaking her mind and questioning bills. Rey says she always keeps her constituents of St. Mary’s County in mind as she makes judgment calls. She finds that if she explains her actions they are supportive, she said. Even the Republican leader is supportive, despite her votes against GOP bills. Rey focuses on the cost for taxpayers. “We were sent down here to lower taxes, that is the biggest push during this past election. The more we spend, the more we will have to raise taxes,” said Rey. Rey, 47, brings a different perspective to the General Assembly. Not only is she a minority as a woman, conservative Republican and the mother of two children. She is also a retired Air Force major with 20 years of service who eked out a 76-vote win over Del. John Bohanan, a respected senior delegate considered a moderate Democrat and an acknowledged expert on education funding. 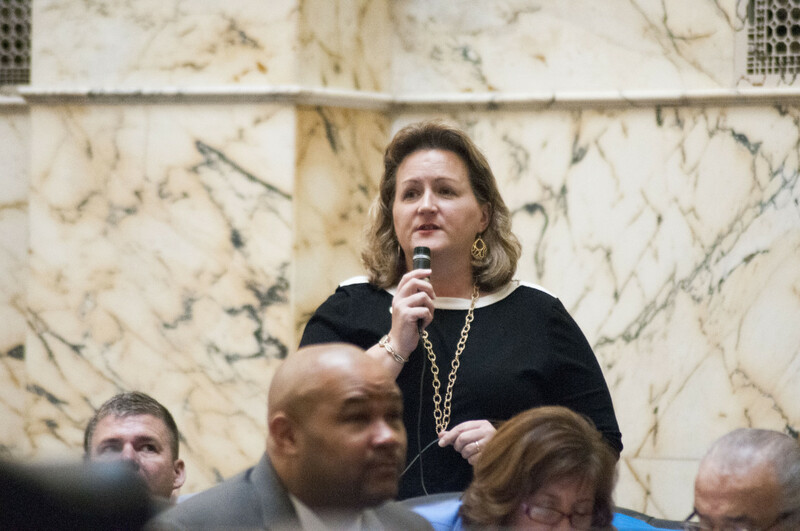 “One thing I know about her is that while she may vote against more bills than some, I can always count on her to support tax relief for Maryland,” said Kipke. Rey was one of only 10 Republicans and just three freshmen to vote against this year’s state budget, HB 70. Her opposition was not to the governor, she said, but to the changes the House Appropriations Committee made. Rey also votes against bills that create task forces to do what state jobs should already be doing. Two bills that are an example of this are HB 926 and HB 780, both passing the House with only Rey’s vote in opposition. HB 926 would create a pilot program that trains police in Baltimore City and County to deal with mentally ill citizens. Rey believes the creation of a special unit is unnecessary. “They’re already doing this, they want to create these special units…we are already training everybody to handle this,” said Rey. A similar issue arose with HB 780, a bill to create a Task Force on the Prevention of Child Abuse and Neglect. A House Republican was the lead sponsor and it had 14 Republican co-sponsors along with a handful of Democrats..
“On that one, it seems duplicative of what we already have in the government…If that’s what their job is, why aren’t we making them do their job versus saying ‘oh you’re not doing your job good enough, let’s go ahead and create another task force,” said Rey. In Rey’s opinion, if local governments can complete a task with existing resources, why do they need to come to the General Assembly and put it into law? “It’s just a matter of ‘why does this need to be a law?’” said Rey. HB86, for example, passed the House with a 125 to 10 vote, moving onto the Senate for review. This Montgomery County bill authorizes student members of the county’s Board of Education to vote on some issues.